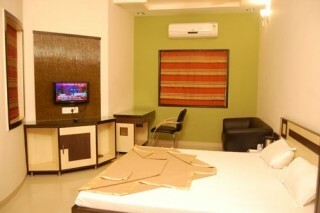 This is a decently furnished room, well-equipped to provide you with a pleasant stay. 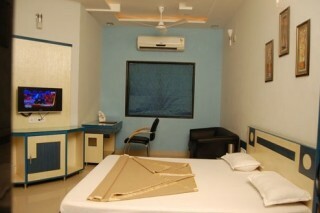 The room is air-conditioned, and has a double bed, a couch, a writing desk and a flat screen TV to keep you entertained. A pastel accent wall lends the room a calming ambience. 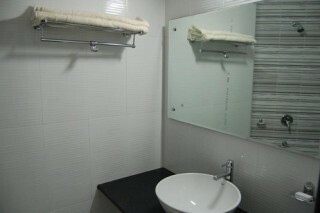 The washroom is modern and well-fitted. 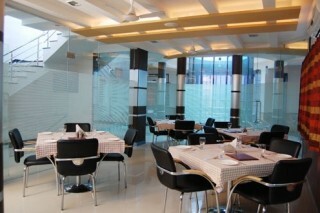 An in-house restaurant in the property takes care of all your meals. It is a pleasant retreat set amidst the lush forested hills, Mt Abu is a green oasis in the barren deserts cape that's Rajasthan. Situated at the highest peak of the Aravali at an altitude of approx. 3800 Feet, one can hardly fail to be impressed with the grandeur and the scenic beauty, the gigantic blocks of rocks, towering along the crest of the hill, are especially striking, in some cases so weather-worn, that they present most fanciful and weird shapes, while in others appear so slightly balanced as to be in danger of rolling down. Chandravati Bridge on West Banas River Nearby Garasia villages- their life and culture Jirawala Bhadrakali Temple Varman Ambaji Mount Abu Mungathala Rishikesh Temple Pawa Puri-Jain temple complex this place is 57 km from Abu Road Station. Brahma Kumaris World Spiritual Organization Gandhi Park Near 4km. situated Vithal Bhagwan Temple in Ore village.